These are the mouthwatering meals to seek out in Rome, Tuscany, Venice and more. People often ask me where to eat in Italy. This isn’t as easy of a question to answer as you might think. While Italy is one of the world’s great culinary destinations, I’ve had a lot of disappointing and frankly forgettable meals there. Italian Michelin star restaurants, in particular, have left me wanting. It’s possible to stumble upon an incredible meal. More often than not you find yourself famished so you stop at a little trattoria. The prosciutto and melon is good and the setting, like sitting at a cafe on the Piazza del Campo in Sienna, makes the food taste better than it actually is. 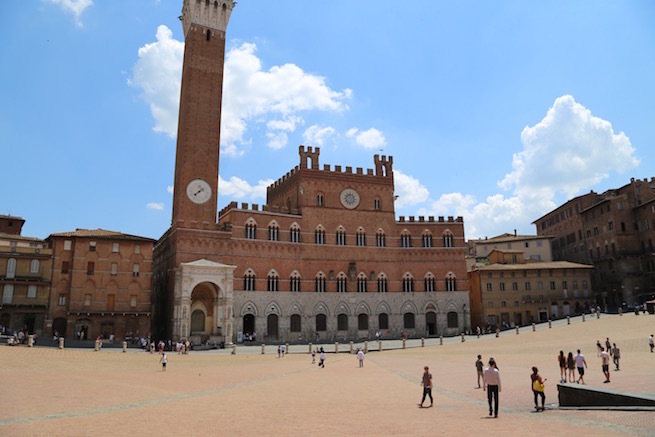 Sienna’s casual cafes around the Piazza del Campo aren’t bad. 1. Simple is often better than fancy. 2. Look for restaurants that are busy. 3. Look at the food that is being brought out before pulling up a chair. Do pizzas look bubbly and fresh? Are salads bright and healthy or sad and droopy? If you do happen to be in the vicinity of any of the following restaurants go! 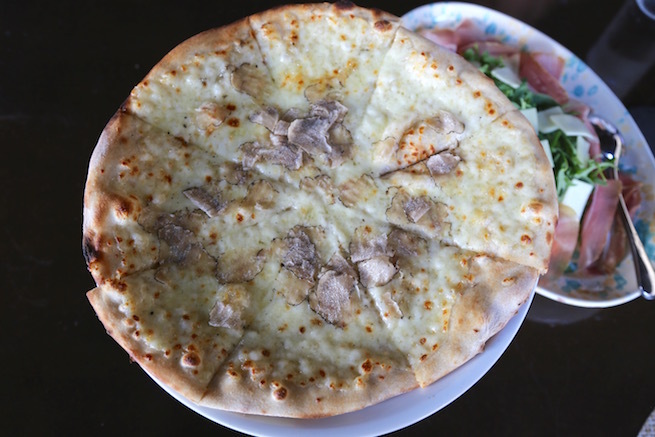 The pizza with truffles at Osteria La Canonica is delicious. My husband and I loved this restaurant so much, we dined here both of the nights we stayed in Vernazza on our honeymoon. The food is simple and delicious: pasta with clams and shrimp, grilled octopus and seafood soup in a slightly spicy tomato-based broth. It’s the location, however, perched on top of a stone tower with terraces that seem to cantilever over the Mediterranean Sea that is truly unforgettable. 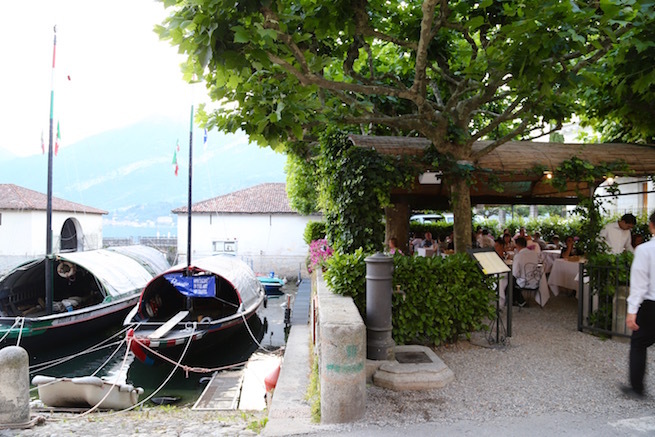 The best restaurant in Bellagio is located a mile from the touristy center. When you visit the town of Bellagio on Lake Como, it’s easy to see why it inspired an entire hotel and casino in Las Vegas. The dramatic location on the point of land where Lake Como forks is stunning. The best restaurant is not in the heart of town, it’s about a mile walk just behind the neoclassical Villa Melzi. All Darsene di Loppia is located next to the dock where local moor their fishing boats. It’s a cafe and coffee shop by day and a more refined restaurant at night with many tables situated beneath a leafy pergola. The fresh fish and handmade pasta are delicious. Dishes incorporate the best seasonal produce like John Dory with grilled peaches. 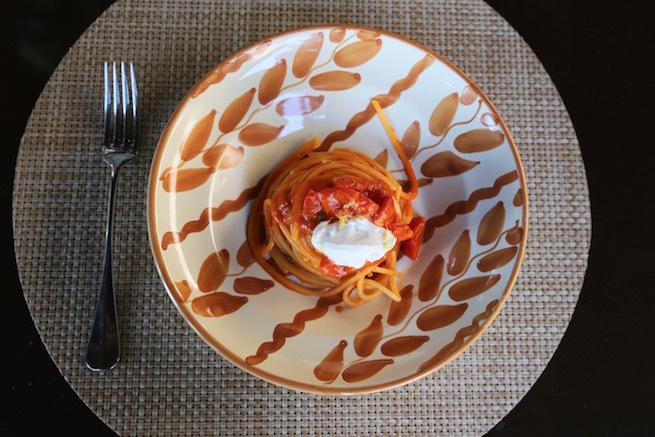 This simple dish is made perfect by the use of peak season tomatoes. 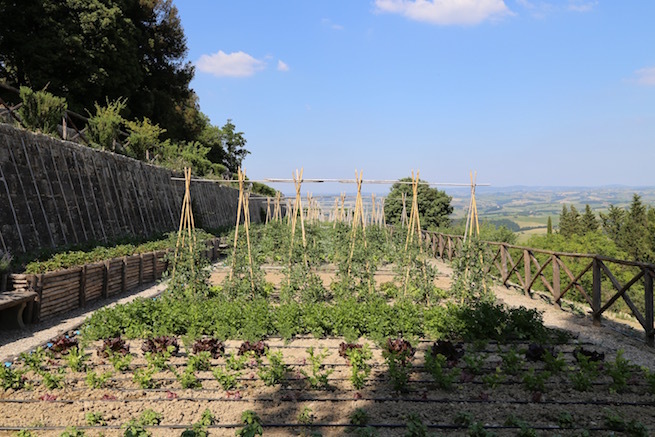 The kitchen garden at Rosewood Castiglion del Bosco. The trattoria at the Rosewood Castiglion del Bosco, a luxury hotel that occupies a hilltop village in Montalcino, offers a refreshing departure from your typical hotel restaurant. Tables are located on a veranda overlooking the valley and dishes are simple and rustic like aromatic white truffle pizza and sweet, tart tomato pasta with goat cheese and lemon zest. Much of the produce used in the restaurant comes from the organic kitchen garden just next door. 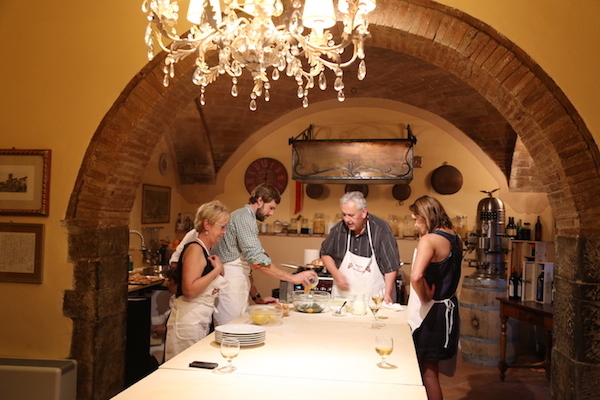 Il Falconiere offers one of the best cooking classes in Tuscany. The main reason to visit or stay at Il Falconiere, a Relais & Chateaux hotel in a vineyard below Cortona, is the cooking school. Chef Sylvia Regi Baracchi teaches students to make Etruscan specialties like gnocchi, Panzanella salad, and cantucci, a delicious almond cookie, in a beautiful country kitchen. Afterward, students enjoy the fruits of their labor in the hotel’s one Michelin star restaurant while looking out over the Tuscan hills. It’s fun to drink a glass of wine at the butcher shop before your meal at Officina della Bistecca. 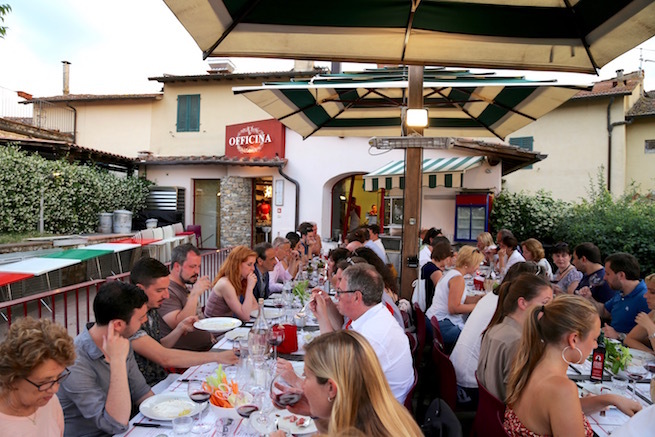 Dario Cecchini’s restaurants have made the small Tuscan village of Panzano-in-Chianti a pilgrimage point for meat lovers. There’s Solociccia, a nose to tail tasting dining experience, the more casual Dario DOC and my favorite Officina della Bistecca. The restaurant offers a fixed price lunch and dinner menu daily (50€). Guests enter through Cecchini’s red and white striped butcher shop. Before dinner, you can enjoy lard spread on thick country bread and a glass of red wine, but the main event takes place at a communal table outside. Beneath green and white awnings diners devour a family style meal of steak tartare, Panzanese steak and Bistecca alla Fiorentina (Tuscan Porterhouse), the local specialty. It’s all served with jugs of simple red table wine (you’re welcome to bring your own for no corkage) and finished off with olive oil cake for dessert. 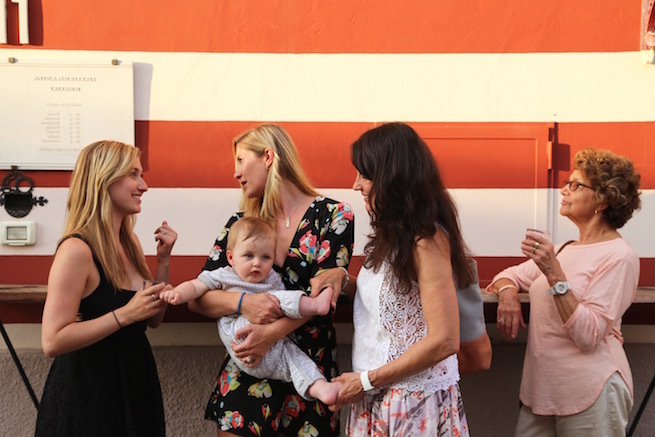 Family style dining adds to the experience at Officina della Bistecca. This restaurant in Montepulciano is another place to try Bistecca alla Fiorentina. In the narrow restaurant, guests sit packed in next to other diners at communal wooden tables. The no-nonsense proprietor hacks off a piece of ribeye and brings it to you on a piece of brown paper marked with the weight and price. If you’re happy with it he takes it back and grills it in a wood-fired oven. The outside is charred and salty, but the inside is on the right side of rare. That’s how you want it. You will fight over who gets to gnaw on the bone at the end. Osteria Aquecheta also serves pasta but the bistecca and simples sides like Tuscan white beans and potatoes are best. My husband and I went on a pizza crawl in Naples once and this legendary spot ended up being our favorite. Because it’s so famous, there’s almost always a swarm of people outside waiting for a table. Normally, this would be a big turnoff, but they do a good job getting people in and out. The perfectly blistered Margherita pie with dollops of mozzarella nestled in a bright red tomato sauce is the gold standard. The historic restaurant was established in 1870 and it only serves two pizzas, the Margherita and an even simpler marinara. The green and white tiled interior is almost austere, but the pizzaiolo’s in white hats tossing dough and shoveling pies in and out of the wood-fired oven give the restaurant plenty of character. My memory of the pizza I devoured here is so vivid. I can recall the burnt smell of charr, the yeasty flavor in the crust contrasting with the zippy tomato sauce and creamy cheese. Thinking about it makes my mouth water. Whenever I’m in Rome I stop at Gabriele Bonci’s pizza al taglio spot near the Vatican. Bonci, considered a pizza god in Italy, is credited with reintroducing high-quality pizza to Romans who made do with cheap subpar pizza for too long. Bonci uses ancient spelt in his dough and tops pies with local ingredients like scamorza cheese, hazelnuts and arugula. This restaurant in Monteverde on the outskirts of Rome is the perfect neighborhood trattoria. Originally opened in the 1950s, many of the dishes have been on the menu for decades. The current owners purchased the restaurant in 2009. They’ve given it some great updates like a wonderful natural wine list with great bottles from throughout Europe. The salty and savory Pasta alla Gricia made with guanciale and Pecorino Romano is one of the world’s great pasta dishes. 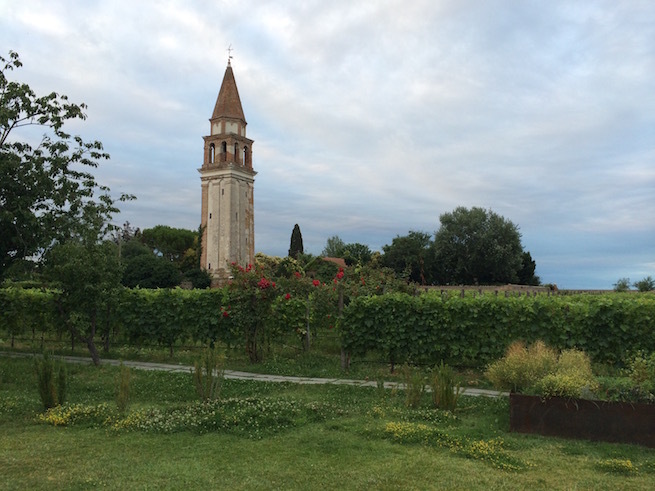 Venissa’s location inside a walled vineyard makes it an unforgettable dining experience. The setting maybe be the most impressive thing about this restaurant on the island of Mazzorbo. 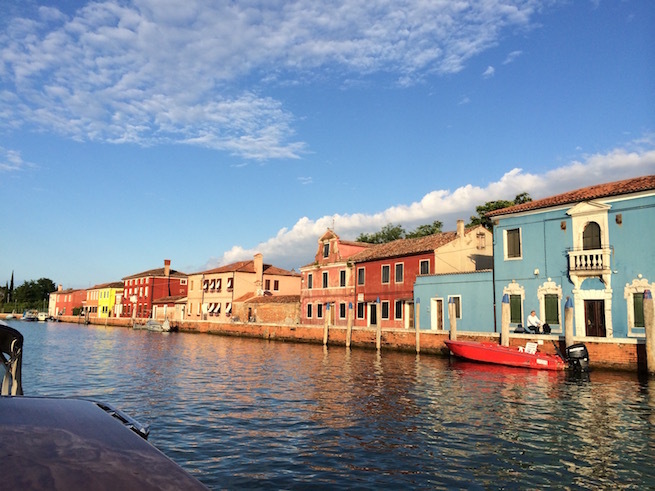 It’s a 30-minute boat ride from Venice and set within an ancient walled vineyard were the Dorona grape, a little known Venetian varietal, grows vigorously. The restaurant builds its tasting menu using ingredients from the lagoon and the estate’s vegetable garden. Dishes might include spaghetti with fresh lagoon anchovies and wild spring onions. Many of Venice’s best restaurants are outside the touristy center on neighboring islands like Mazzorbo. What is your favorite restaurant in Italy? Please share in the comments below. Planning a trip to Tuscany? Check out my Guide to Tuscany. And if you’re heading to Rome, here are my three favorite hotels.